Years of neglect are taking a toll on some Cleveland-area cemeteries. Those who are directly affected by the mess cannot speak up, so the Jewish Federation of Cleveland is speaking for them. "They were just in deplorable conditions. And we've gone in already and cleaned them up," says Barry Reis, CFO of the Jewish Federation of Cleveland. Through the organization's Cemetery Preservation Campaign, the JFC now manages six Jewish cemeteries and more than 14,000 plots. Volunteer groups helped polish things up. "The congregations that owned the cemeteries have diminished over time or they don't have the financial means to care for them," says Reis. That's why the JFC is campaigning for $3.5 million to eventually manage all 19 Jewish cemeteries in the area. There is still a lot of work to do. Tombstones need resetting. Ivy needs trimming. Neighbors are already noticing changes at Lansing Cemetery near Harvard and E. 55th Street. "Before the grass was so high it was higher than the gate was, but they are doing a great job now," says Barbara Tate. "There's no greater mitzvah, which means 'good deed' in Hebrew, than doing something for someone who is unable to thank you for it," says Reis. "I love that the Jewish Federation is doing that here and we appreciate that," says homeowner Betty Dabrowski. 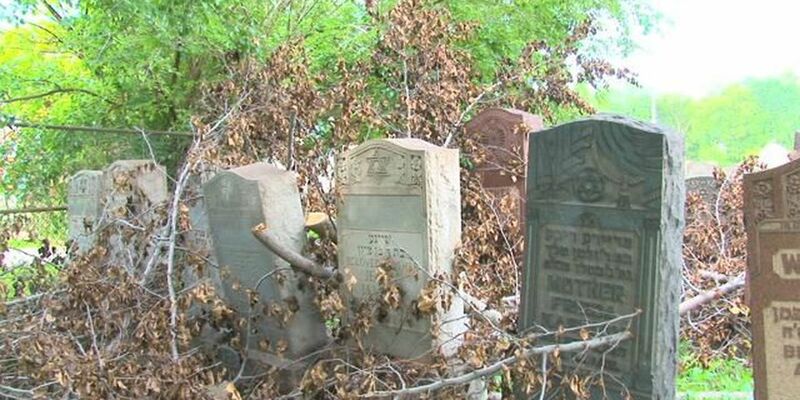 To learn more about the Jewish Federation of Cleveland's cemetery preservation efforts, CLICK HERE.